The Massachusetts Department of Correction’s Domestic Violence Office has been awarded a mini-grant from the Community Health Network Area9 (CHNA9). Funding is made available by Heywood Healthcare and CHNA9 through the Community Health Initiative. You are cordially invited to participate in this book discussion. Call in advance to register and receive the book, Journey, by Danielle Steel. 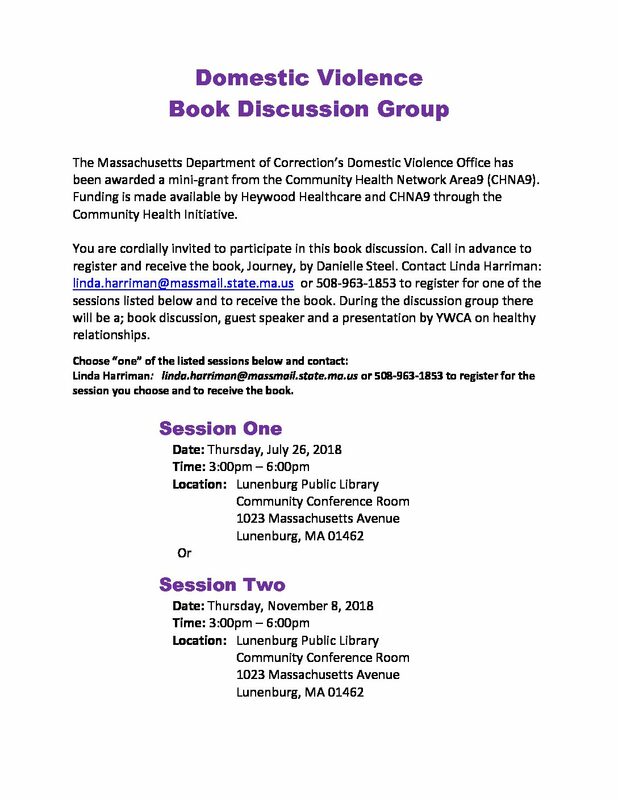 Contact Linda Harriman: linda.harriman@massmail.state.ma.us or 508-963-1853 to register for one of the sessions listed below and to receive the book. During the discussion group there will be a; book discussion, guest speaker and a presentation by YWCA on healthy relationships. Linda Harriman: linda.harriman@massmail.state.ma.us or 508-963-1853 to register for the session you choose and to receive the book.